Leuking northwast ower Burbank frae Griffith Park. 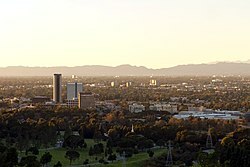 Motto(s): "A city built by People, Pride, and Progress"
Burbank is a ceety in Los Angeles Coonty in Soothren Californie, Unitit States, 12 miles (19 km) northwast o dountoun Los Angeles. The population at the 2010 census wis 103,340. ↑ 1.0 1.1 1.2 1.3 1.4 "City Council". Burbank, CA. Retrieved May 3, 2015. ↑ "Burbank". Geographic Names Information System. Unitit States Geological Survey. Retrieved November 6, 2014. ↑ "Burbank (city) QuickFacts". United States Census Bureau. Retrieved April 9, 2015. ↑ "American FactFinder - Results". United States Census Bureau. Retrieved May 24, 2015. ↑ "Geographic Identifiers: 2010 Demographic Profile Data (G001): Burbank city, California". U.S. Census Bureau, American Factfinder. Retrieved February 7, 2013. ↑ 10.0 10.1 10.2 10.3 10.4 "Burbank's Sister Cities". Burbank Sister City Organization. Retrieved July 22, 2010. ↑ "Artsakh's Hadrut and Burbank Become 'Friendship Cities'". Asbarez. November 14, 2014. ↑ "Networks, town twinning and partnerships" (PDF). City of Solna. Retrieved August 4, 2013. Wikimedia Commons haes media relatit tae Burbank, California. This page wis last eeditit on 11 Mairch 2018, at 18:14.